Treat yourself to a beautiful updo for any special occasion! In Wiltshire, Bristol and Bath areas. Your wedding day is the most important day of your life and every bride wants to look and feel their absolute best. We all dream about this day, and how special we’ll feel when all eyes are on us. As a freelance mobile hair stylist I love to help every type of bride feel beautiful and confident for their special day. Katie Mence is based in Melksham, Wiltshire. Perfectly placed to travel to surrounding areas in Wiltshire for your wedding day. Katie can also travel to Bath and Bristol. As a qualified hair stylist, my aim is to create beautiful hair for each individual, giving you the exact look you’ve always dreamed of. Hair is very personal so my aim is to create a unique style for your wedding day that fits your likes, needs and personality; whilst framing your face beautifully for your big day. With carefully timed plans created in your trial, I’ll ensure that all bridesmaids and mums are seen to properly and will also look and feel beautiful. Katie is a freelance hair stylist based in Wiltshire. 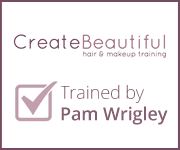 Katie’s been trained by award winning stylist Pam Wrigley at her create beautiful hair courses. Katie has lots of experience in adapting styles to suit each individual client. Whether that’s changing how the hair falls around your face to compliment your jaw line, pinning in a certain way to cover your ears or working around a special accessory you’d like built into your style. Katie offers beautiful hair ups at affordable prices and is passionate about making each client feel special on the day. She originally took up hairdressing because she loved the creative aspect of putting hair up. She is currently training in make-up so that she can eventually offer the full package. Currently Katie is available for a range of services including Editorial, Weddings, Proms & Special Events.